the School of Physics at Peking University from August 29 to 31, 2017. The meeting consisted of short review talks about the scientific and the outreach projects by the German PIs (with the a few exceptions) complemented by talks from Chinese students and Post-Docs, that gave more details about certain subprojects. All except 3 German PIs and all Chinese PIs took part in the meeting, in total, there were 105 participants [photo]. This early meeting served to get to know each other better and to start or deepen the sino-german collaboration. In addition, 6 Chinese reviewers and two high-level persons from the NSFC were present. Altogether, the meeting left a very positive impression as already quite a number of interesting results have been obtained after just 13 months of the second funding period. For details, see the webage http://indico.ihep.ac.cn/event/7079/overview. For more informatin, details and registration we refer to the webpage. At the symposium "Advances in Effective Field Theories", that took place at the Forschungszentrum Jülich from November 7 to 9, 2016, the world's leading experts on effective field theories in the areas of hadronic and nuclear physics presented their research. This also served as a CRC meeting in these areas. A special focus of the symposium was on the numerous contributions Prof. Ulf-G. Meißner has made to these fields. He was awarded the Lise Meitner Prize earlier this year. On the second day of the symposium Prof. Meißner received the medallion and diploma associated with the prize. There will be three topical sessions each day. Further information and updates on the program can be found here. The International Workshop on Heavy Quarkonium 2014 took place at CERN, on November 10-14 2014. This years CRC collaboration meeting took place in Weihai, China, from July 25th to July 29th. The programme of the meeting can be found on the meeting webpage. A one-day mini-workshop on B -> pi pi l nu decays with talks on the experimental status as well as various theoretical methods, and ample discussions on future collaborations between the members of the CRC and external guests took place at the HISKP on February 21 th, 2014. A two day workshop on issues related to strangeness in hadrons and nuclei took place at the ECT* in Trento on December 5th and 6th. The program consisted of five overview talks and one panel discussion on open issues in hyper-nuclear physics. The talks can be found on this page. A two day workshop on Lattice QCD was held from 23rd of July until 24th of July in Bonn. This workshop gave the scientists of the CRC110 from lattice QCD and related areas the possibility to discuss the progress of their work and to strengthen the collaboration. The details of the programme are available on this page. A two day workshop on threshold phenomena was held on April 27-28 at IHEP in Beijing. It brought together young and experienced researchers in the field and allowed the participants to exchange ideas, discuss details of different theoretical methods, identify key issues in the study of hadron physics. Related projects are A.1, A.2, A.3, A.5, B.2, B.3, B.4 and B.5. The 9th International Workshop on Heavy Quarkonium 2013 will take place at IHEP, Beijing, P. R. China from 22 - 26 April 2013. It is coorganised by members of the CRC110. A workshop on strangeness and nuclear physics (mostly projects B.5 and B.7) took place at TU-München from October 25th to October 26th, 2012. The agenda of the workshop is available as a PDF file. The PDFs of the talks can be found on the workshops page. 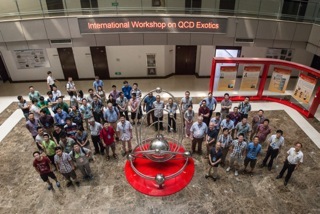 The first CRC meeting took place place at the Kavli institute for Theoretical Physics (KITPC) from July 2nd to July 6th as part of the program "From nucleon structure to nuclear structure and compact astrophysical objects". The program schedule and the list of speakers and talks can be found at the webpage of the KITPC.